The pictures of our image data bank are available for design assistance. Here you will find our logo, product images and installation examples. The copyright of the pictures shown on this website lies by ÖkoFEN. If you want to use a pictures (for publications, etc. ), simply click on the link under the picture to download it in high resolution quality. Upon publication, please indicate ÖkoFEN as image source. All images (300dpi) are protected by international copyright laws. The Pellematic pellet heating boiler has a well-proven technology and convinces with its absolute reliability. The ÖkoFEN pellet boiler Pellematic is the original among the pellet boilers. Available in a power range from 10 to 224 kW, the Pellematic match the required power output demand of each house. The Pellematic, installed in a boiler room previously used for an oil boiler. The boiler change is quick and simple. The oil tank room can be converted into a pellet store. The ÖkoFEN comfort ash box makes the ash disposal easy and 100% free of dust. The emptying of the ash box is required only once to three times per year. Unique and only available at ÖkoFEN: The Pellematic Condens with the latest generation of condensing technology achieved a record efficiency of 107.3%. Condens condensing technology revolutionized the viability of condensing technology with pellets. Besides allowing its use in high temperature systems with radiators, you can also dispense with the installation of a buffer tank. Easy placement: Thanks to its compact design, it is almost no dismantling work necessary to bring the Pellematic Condens in the boiler room. Thanks to its compact design and small footprint, the Pellematic Condens cuts a fine figure in every boiler room. A particularly practical solution is the Pellematic Smart. An all-in-one device with the highly efficient Condens condensing technology. The Pellematic Smart combined buffer, pellet boiler and heating circuit assemblies in a single compact device on only 1.5 square meters. Highly efficient pellet heating technology has been intelligently brought together in only 0.9 m2. Just like its big brother, the Pellematic Smart, the Pellematic Smart XS is an impressive all-in-one solution that unites all functions of the heating system. Pellet heating technology for optional combination with solar. The revolutionary Condens condensing technology in a powerful, ultra-compact, all-in-one central heating system. Maxi PELLEMATIC is a 56 kW boiler based on the proven technology of the Pellematic. Suitable for commercial, industrial and large-scale projects. Especially for the large-scale requirements: cascade systems of two to four boilers generate high reliability and low wear. When full power is not required, only the boilers that are actually needed will be called into use. The Pellematic Maxi with condensing technology builds on the proven technology of the Pellematic series offers highest levels of efficiency. The latest generation of condensing technology extracts even more from every kilogram of wood pellets. Up to 15% more efficiency – as standard in all Condens models. 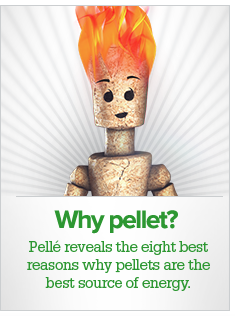 The PELLEMATIC with integrated pellet hopper is ideal for rapid transition to sustainable wood pellet heating. The Pellematic with integrated pellet hopper is a fully automatic pellet heating system with the advantages of the Pellematic series. Only filling the hopper with pellets is done by hand. The customer saves the investment and the room for the pellet storage. Pellet fabric tank Flexilo for room ceiling up 215 cm. Pellet fabric tank Flexilo compact for low ceiling rooms. The innovative functional principle with lateral tension springs allows up to 60 percent more storage volume in the same space. Thanks to the lateral tension springs the total available space is used. A practical alternative to the pellet storage is the fabric tank. The ÖkoFEN Flexilo can be placed in the boiler room and is quickly installed. The Flexilo Compact is ideal for the storage of large amounts of pellets. Its innovative functional principle allows the storage of up to 8.5 tonnes of pellets to less than 7 square meters. A modern pellet heating system takes up no more space than an old oil boiler. With the ÖkoFEN innovative heating and storage technology the entire heating system can be accommodated in a small space. The classic pellet storage solution is the storeroom. Sloping floors are installed for optimal emptying of the room. The pellets slide down to the discharge screw in the middle. If the storage room is located directly next to the boiler, a screw system is used to carry the pellets automatically to the boiler. The sun is an inexhaustible source of energy. The solar collector Pellesol allows the use of solar heat for the heating system and thus reduces heating costs. The logical complement to an ecological pellet heating. The sun is an inexhaustible source of energy. The solar collector Pellesol (sectional view) allows the use of solar heat for the heating system and thus reduces heating costs. The sun is an inexhaustible source of energy. The solar collector Pellesol allows the use of solar heat for the heating system and thus reduces heating costs. Image: solar collector in-roof version with matching aluminum mounting frame for outdoor installation. Remote control/master control Pelletronic Touch. All ÖkoFEN pellet heating systems are operated via a touch screen. The heating circuit controller Pelletronic regulates the entire heating system in the building. Easy and intuitive heating operation via touchscreen is now also easily possible from the living room. Convenient heating operation from anywhere - heating system operation comfortably from your sofa or on the way, with the Pelletronic web app. With my.oekofen.info - portal, the ÖkoFEN heating system can be comfortably operated via smartphone, tablet or PC from anywhere in the world. ÖkoFEN provides a comprehensive customer service network. So a fast and effcient ÖkoFEN service technicians is always available to assist you. ÖkoFEN provides a comprehensive customer service network. A fast and effcient ÖkoFEN service technicians is always available to assist you. ÖkoFEN develops easy and quick solutions for the installation of pellet heating systems in coordination with the professional installer. Pellets and solar, the ideal couple: A detached house can be completely heated with a pellet boiler combined with a storage tank and solar collectors. The pellet Energy-Box is the flexible heating version in concrete construction for outdoor installation. Particularly suited for buildings with a higher heat demand. The ÖkoFEN headquarters in Niederkappel, Upper Austria. The company's strategy includes decentralized locations to bring work opportunities to more people. The ÖkoFEN Germany facilities are also located in a rural area. In Mickhausen, near Augsburg. The ÖkoFEN France facilities in St Baldoph near the French Alps. The ÖkoFEN Spain and Portugal building is located in Pontevedra in northwest Spain. All ÖkoFEN products are assembled in Niederkappel. From here, the pellet heating systems are delivered in all countries.